If you’re a Final Fantasy fan, you definitely will know the yellow birds called chocobos. These fluffy animals are mostly used as transportation in the games but why would this be their only adventure? Square Enix decided in 2007 to give our feathered friend a spin-off of his own in Final Fantasy Fables: Chocobo’s Dungeon. 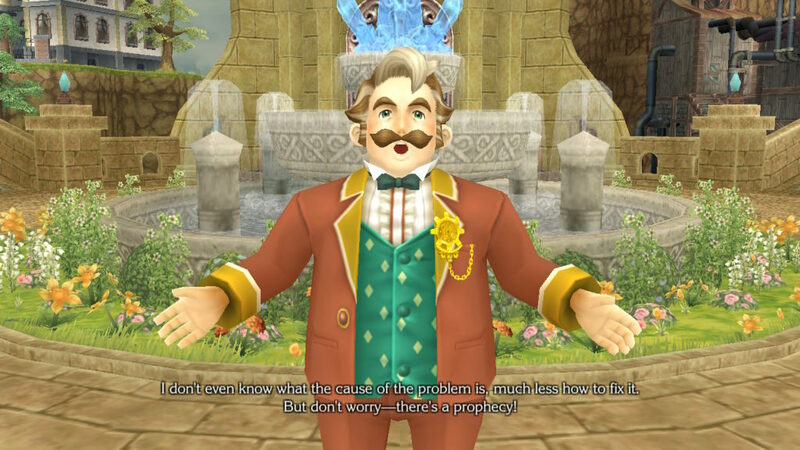 Recently, a new version of this title was released for the Nintendo Switch, with a dashing new name. 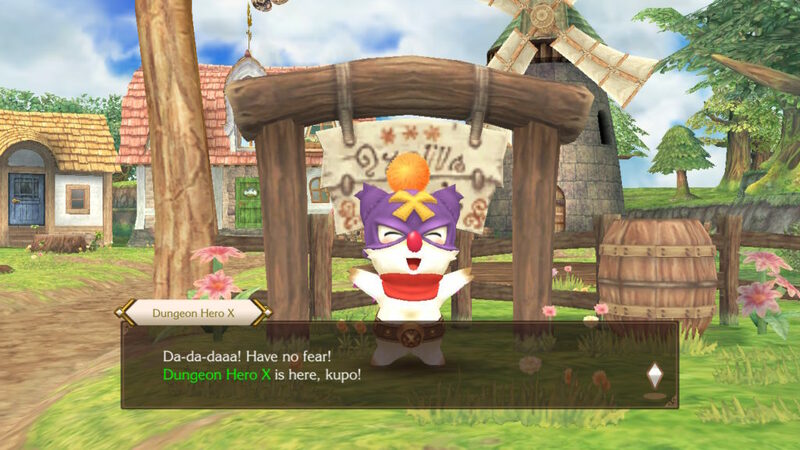 Let’s get ready for endless dungeons in Chocobo’s Mystery Dungeon EVERY BUDDY! We are thrown in the game in a dashing way. Speeding through the dessert, you are met by a young man, the one and only Cid, and his trusty companion Chocobo. Not too long after, the ride stops at a mysterious tower in the middle of the sea of sand. Seems you’re looking for the Timeless Power which is hidden in this building. After an interesting trip through the several floors and fighting off monsters, it becomes clear that you’re too late. Irma and Volg, two evil-looking types, beat you to it and although you would love to stay longer and chat, a weird light is stopping you in your tracks. Before you know it, you’re flying through rays of light and not too long after that you make an unpleasant landing in a new location. Lostime, a town shrouded in a cloud of mystery, seems to be your new home base. There are some strange things going on though, as all memories are forgotten thanks to the power of a strange clock. It’s your task to restore order and memories while finding a way back to your own time. Just as expected from a Square Enix title, there is quite some story added to the game. A lot is going on and although the main focus is on Chocobo, the side characters have their own charm and development through the game. It might seem a bit chaotic at the start but things become clear the further you are in the game. 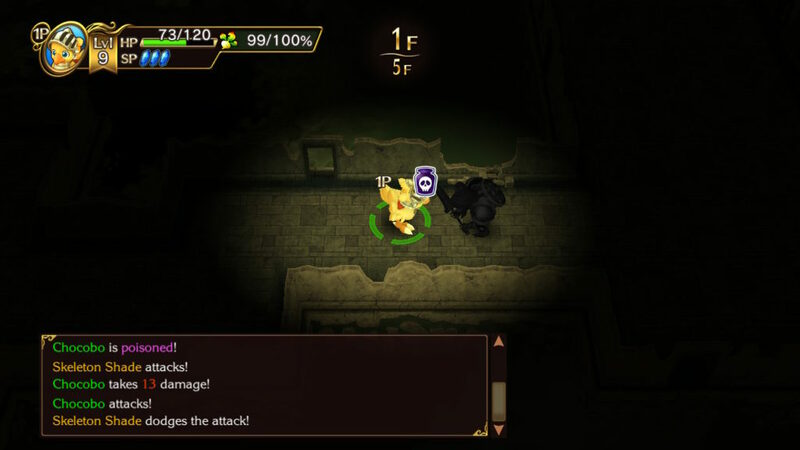 As this game is a newer version of Final Fantasy Fables: Chocobo’s Dungeon it’s only logical that there are a lot of similarities. The graphics have received a nice brush-up and it uses the possibilities of the Nintendo Switch. Both the characters as well as the backgrounds look crisp and neat, with colors splashing off your screen. The detailing is really well done and you’ll certainly enjoy watching the story unfold in these sceneries. Facial expressions really pop and convey the emotions well, which is a really fun aspect. The dungeons change every time you enter and although it might seem dull after a while, the combination of both the labyrinth as the background makes it really a joy to watch and an interesting adventure. The enemies have a lot of characteristics, making them stand out really well and almost too gorgeous to kill… but let’s face it, you just want to kick their faces. Just like the graphics, the music also has received an overhaul. The most iconic tunes might actually be when running around or entering a dungeon and you hear those familiar tunes from other Final Fantasy games. Played Final Fantasy VIII? Be ready for some nice tunes from this game, same for other of the titles. It really makes you smile when you hear these familiar but chibi-like tunes as it really fits the game but also takes you back in time (if you’ve played these titles of course). Sounds are spot on and makes immersion complete while the voice acting helps as well, although not all conversations are guided by voices. Only the important parts or cutscenes, which is kind of a shame in a way. Chocobo’s Mystery Dungeon EVERY BUDDY! 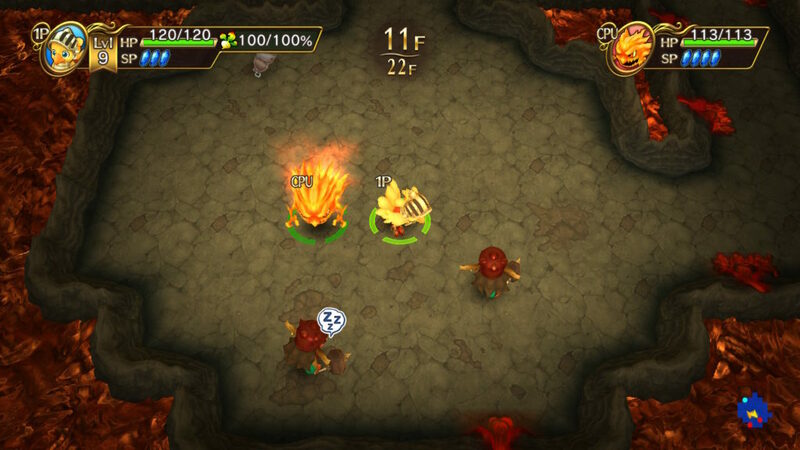 is an RPG with a dungeon crawler element and the combination of both is actually rather entertaining. 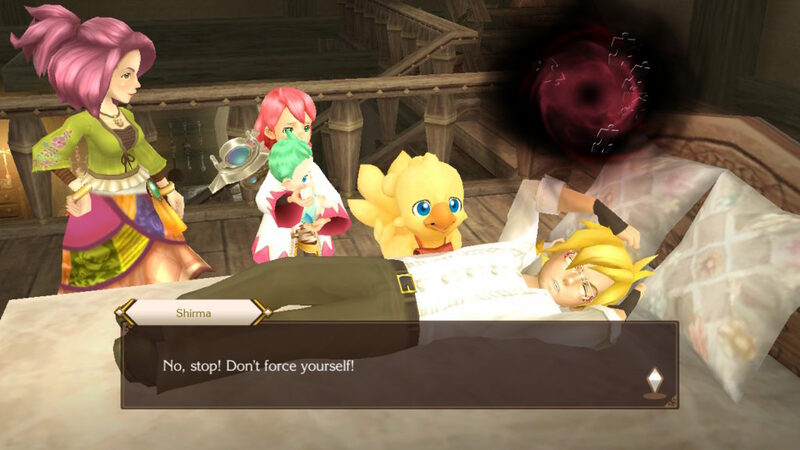 At the beginning of the game you can choose the difficulty level of the game, namely if you want to lose all your items after fainting in a dungeon. Depending on your skill in these type of games you might want to choose normal or hard. There are quite some gameplay elements this game has to offer, we are only going to touch upon the biggest aspects of the game. First of all, you have two types of environments to explore. You have the town of Lostime where you can roam freely and find hidden items or visit shops, while there is another part in the dungeons. Here, you can discover a whole new layout every time you enter a labyrinth, but your movements are restricted by these walls of course. Lostime has a few shops for you to go to, one of the most important ones being the Storage. You can carry only a limited amount of items, so whenever you find something decent, it’s best to drop it there (especially if you’ve chosen the hard difficulty). Next to items, money is also safe here and you can also buy and/or sell items too. You can also have a drink in the cafe or visit the church. Here you can go back to some of the tackled dungeons and get cursed items blessed and make them ready for use. Going into labyrinths means that you will encounter monsters, so it’s best to have your equipment in top-notch state. When you progress the game, you will unlock the Forge where you are able to improve your armor and weaponry. The way of moving around in dungeons is different compared to the town area. In the labyrinths, you walk per square and you’re able to walk horizontal, vertical or diagonal. Every time you move, the enemy is also able to move or attack you. Sometimes it’s even better to just do a kick in the air so that enemies come into attack range and you can strike first rather than moving and giving that advantage to the monster. Next to normal attacks, you can also perform special abilities that are linked to jobs. Before you dive into a dungeon, you can switch these jobs and pick a more suitable one. At the beginning of the game, there isn’t much available but you’ll unlock more by leveling up and bringing back memories to people. 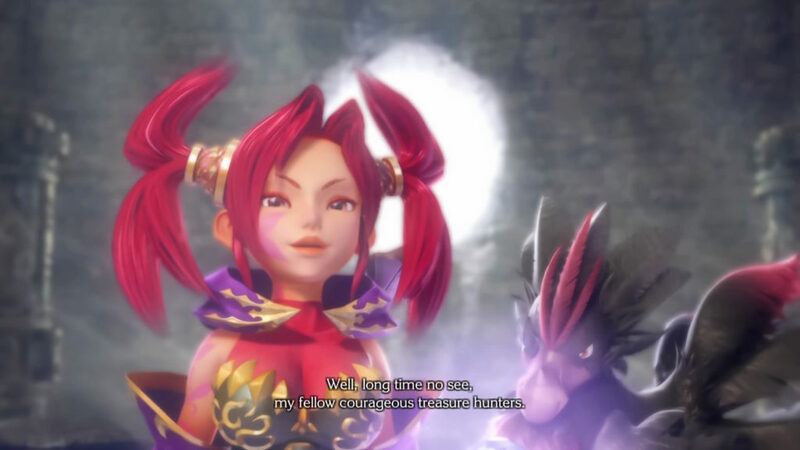 Killing monsters doesn’t only give you experience but also monster points. When you’ve obtained enough, you’re able to summon these critters as an extra companion that will help you during battles. This can both be CPU or a friend as it’s possible to play this game with two. This certainly gives you an advantage during battle. The same can be done with some of the characters you unlock while venturing the game. At the end of the dungeon, after going through a certain amount of floors, you have to face the boss of that level. Be sure to try and find the pattern and be sure to heal up as you can’t die. Next to monsters, there are also traps all over the place. These are both hidden as in plain sight but sometimes you accidentally step over it as the joystick is really sensitive and makes Chocobo go haywire. Of course there are also items lying around, which can help you tremendously. For example, Chocobo gets hungry after a while so you need Ghysal Greens to still it. This is sometimes lying around, so be sure to keep your eyes open. Other items like potions or ethers, armor and weaponry are all spread around as well. The game offers quite a lot of elements for you to explore, as you can also grow flowers on the farm or find mysterious letters. It might feel rather slow sometimes but it’ll get better when you unlock more characters and jobs. One of the downsides are the loading times. Probably because a lot is going on and because of the graphics it takes a while before you can actually start your adventure… go to the toilet, get some snacks, it’s all possible. Chocobo’s Mystery Dungeon EVERY BUDDY! will take you on quite an adventure in endless labyrinths. Guided by cute, colorful, detailed and nice graphics, while the sounds will take you down memory lane. Gameplay wise, you can decide to tackle it alone, with a CPU or with a friend. There are more than enough options for you to explore, like the job system and the different labyrinths. If you like to explore with familiar Final Fantasy elements, be sure to check out this title.